"You will witness my acts 1:8", 1991. “You will witness...” was created for the exhibition, "Salvage Utopia.” Having worked mostly with old things, used objects, things thrown out, lost, abandoned; I am intimate with the activity and ideas of salvage. But addressing the concept of utopia, I was uncomfortable determining what to salvage for others. The most important notion of utopia is in its manifestation in each of us. What feels appropriate is to inspire and remind that utopia is self made and emerges only from one's own critical reflection and vision. It is a hopefulness that each of us can and must actively imagine. Utopia and salvaging is one in the same: a process of inventive beauty emerging from and generating our various and distinct selves. "You will witness..." is a rearrangement of the text on a rosary card something I found in a twist of fate. It read: "You will be my witnesses. ACTS 1:8" I salvaged and reworked the words to read: "YOU will witness my ACTS 1:8." A rubber stamp was made. This text is stamped on the back of each of the 300 mirrors, which travel in an old suitcase. This gesture is intended to be reminiscent and evocative of the practice of the traveling bible salesman of the dust bowl days. 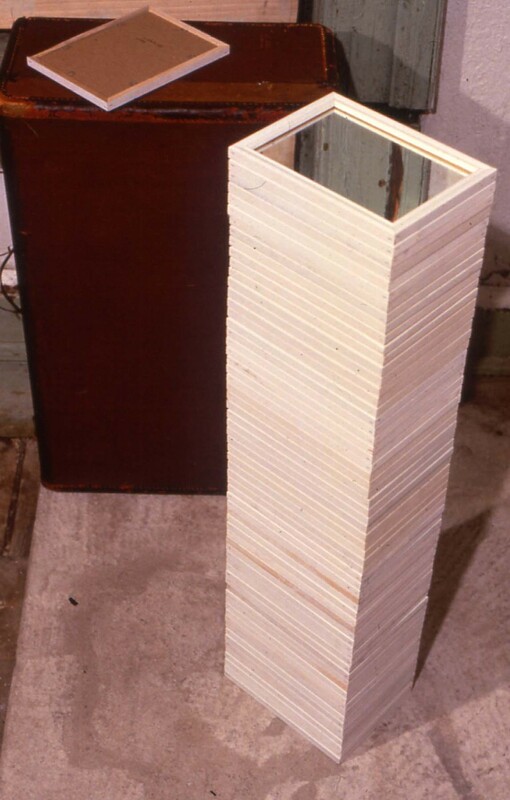 For the purposes of exhibiting, the mirrors have been stacked next to the suitcase in a single column measuring 4" x 6" x 47." The minimalism of this tower of store bought Chinese mirrors situated beside the suitcase challenges separatist tendencies of “high" and “low" practice whether it is in art or activism. Had the text been altered to read: "You will witness your ACTS 1:8," the message would have seemed instructional, even authoritarian. Had the text been altered to read: “I will witness my ACTS 1:8," the activity would remain internal, collapsed, solitary. Instead I invite you to see yourself as activist and witness, as both image and repository of change, talking to ourselves, hopefully urging, not sentencing. 580 Broadway, 9th floor, NYC. For immediate release: A / C Project Room presents the opening show of the 91 - 92 season, Salvage Utopia, in it's new space on the ninth floor of 580 Broadway. The show runs from October 18th through November 20. There will be an opening reception on October 18th from 6 - 8 pm. 'Salvage Utopia' names a utopia predicated on the activity of salvaging, in which remembrance, recovery, and reclamation are the operational principals in the creation of a practical and visionary economy. It is also an imperative which urges us to salvage utopia itself, to reaffirm a tradition of thinking that makes the world anew, that imagines the world differently - the work of the political imagination. Salvage Utopia begins not with a newly discovered place, but in a familiar locale, subject to specific historical change. It is not concerned with an ideal end, the achievement of a harmonious condition, or the stasis in which traditional utopia culminates, but with transition and transformation - it is an interactive, open, unstable process. The artists invited may or may not consider their art to be specifically utopian in intent. It is however, the purpose of this show to explore how a diversity of ideas and strategies can serve as a descriptive and prescriptive model of utopian change, and to demonstrate how this critical impulse - a moment of salvaged social and political hope - renews itself.